With 27 boats racing, the Soto 40 is now an established and successful one-design class that has impressed a lot of competitive sailors. So the next obvious move for the M Boat people was another Javier Soto Acebal design in a smaller size. The new one-design Soto 30 is being built in China and by the time you read this review I would the first boats would be sailing. 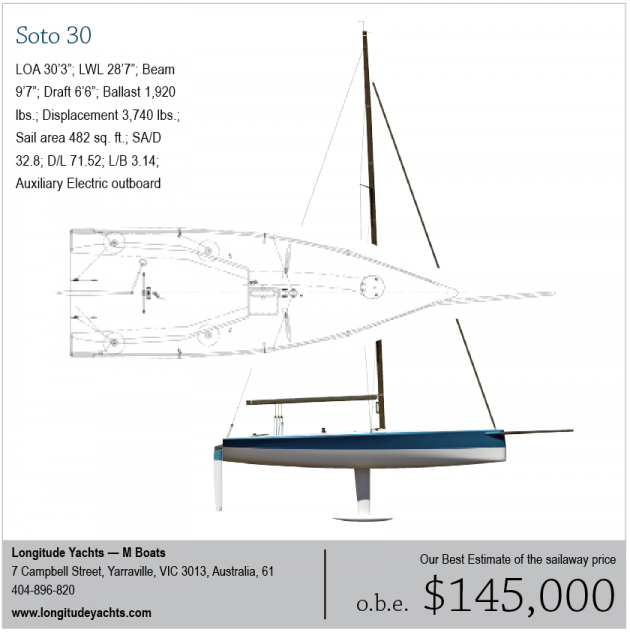 The Soto 30 is a pure and simple sport boat with all the emphasis on performance. The freeboard is high and there is a very subtle chine running the full length of the hull about a third of the way up the topsides. Not sure why the freeboard is so high. There appears to be no rocker to this chine and by the time it reaches the transom it marks the point where the now concave sections flare out to that max beam. Note that the beam at the transom is max beam. I think the idea behind the flared topsides aft is to help get crew weight outboard. The sheer is a dead straight line. The D/L is 71.52 and the L/B is 3.14. The keel fin is carbon and retracts for shipping, protruding out through the companionway hatch. Draft with the fin down is 6 feet, 6 inches. There is 1,920 pounds of lead in the long and narrow bulb. I suspect an outboard rudder was chosen to simplify construction. Note the bow. You can call it a "hatchet" bow that in profile tips aft right above the chine. About 55% of the LOA of the Soto 30 is devoted to the cockpit. This boat, like the Soto 40, is a round-the-buoys racer so the emphasis is on crew efficiency and ergonomics. The backstay trimmer will sit aft of the helmsman. There is a very short traveler on the cockpit sole right ahead of the helmsman. I think this traveler is short because it only helps with fine-tuning the main trim with the vang taking all the down load on the boom. The mainsheet trimmer sits forward of the helmsman with the mainsheet coming off a swivel block on the sole. Jib sheet and spinnaker sheet winches are forward. I see nothing on the drawings or in the specs pertaining to halyard winches. Jib tracks run athwartships and are recessed into the deck. There is a single spinnaker launching tube hatch on the foredeck. This deck is very clean and simple. I do not see any bensons on the cockpit sole for secure footing. Maybe they were waiting to position those when the deck plug was done. By now we are used to big rigs on sport boats and this one is no exception. If I just use I, J, P and E dimensions I get an SA/D of 32.8, and with that square-topped mainsail is a conservative number. The masthead chute will be fun without a halyard winch but with well-timed crew work you can get that chute up without a winch. Jib and main halyard tension can be done with block and tackle. The sprit is carbon and retractable. The mast is a custom, two-piece carbon fiber stick and the boom is aluminum. The standing rigging is Navtec PBO with a stainless steel forestay. Auxiliary power will be provided by an electric outboard with a retractable drive leg. There are berths below but I'm not sure the word "accommodations" really fits this type of boat. I certainly think this boat would be an exciting boat to sail but as with other high-powered sport boats you are going to need an expert crew and plenty of bodies to hold the boat down. It will be fun to watch what this new one-design class does.